If you’ve spent much time on our blog, you know we love rice and Mexican food. 5-Ingredient Spanish Rice is our most popular recipe, and Mexican or Southwest recipes always seem to be our favorites. 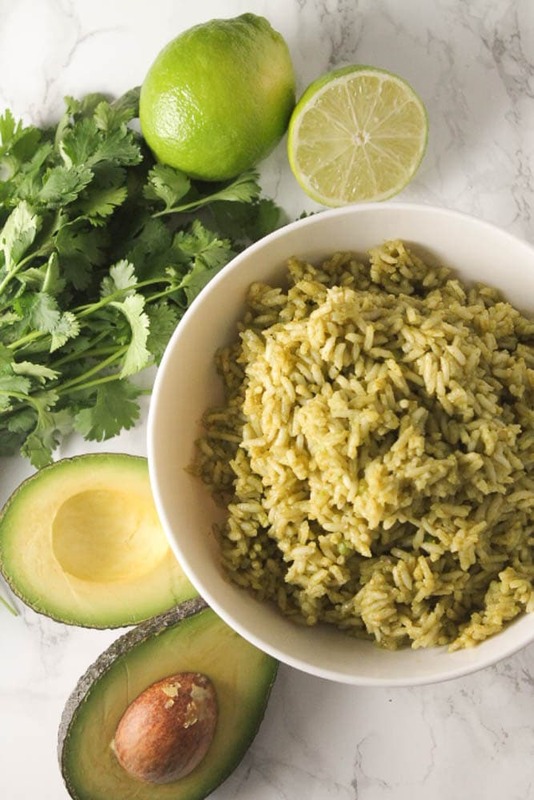 This week I’m making another rice recipe that I absolutely love – Avocado Green Rice. 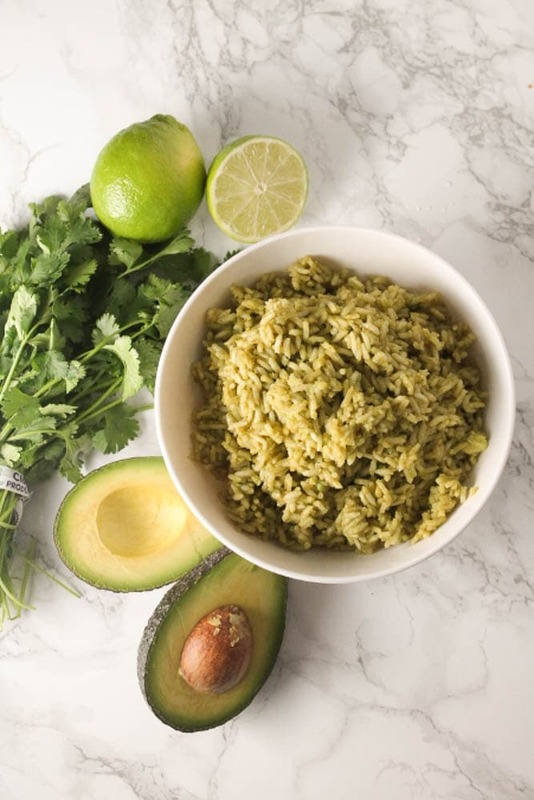 If you’ve never had Green Rice (or Arroz Verde) before, you’re missing out, and the avocado just takes it to the next level. This recipe gets its fresh flavor and touch of spice from cilantro, parsley, jalapeno, lime and garlic. I’ll be honest – this rice is actually great before you even add the avocado, but adding the avocado just gives it an extra kick. 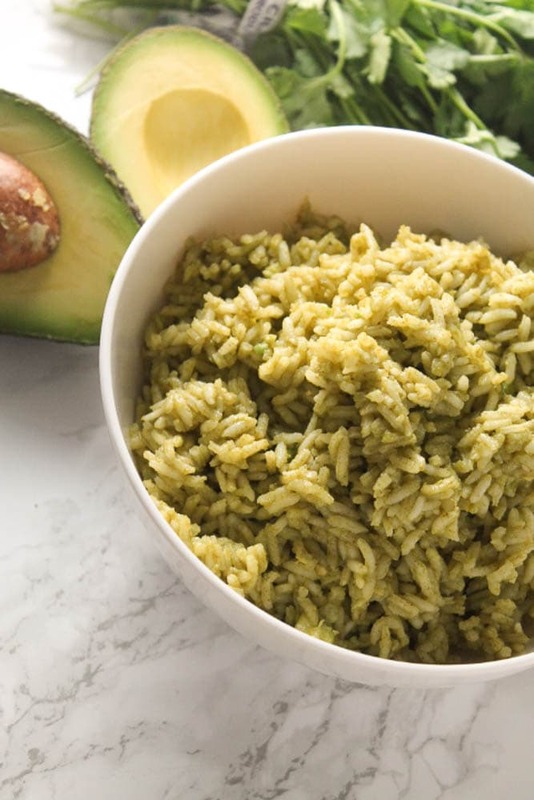 It adds a creamy texture that is so satisfying, and the avocado flavor complements the basic green rice perfectly. Add this rice to tacos, use it in burritos or salads, or (if you’re me) eat it on its own. It’s so good, I could eat a big bowlful all by itself. In a blender add chicken broth*, parsley, cilantro, jalapeno, minced garlic, onion powder, and lime juice and blend until fully combined. Heat vegetable oil in a medium sauce pan over medium heat. Add the rice and stir to coat completely in oil. Cook, stirring occasionally for 2-3 minutes, until rice is lightly toasted. Add the chicken broth mixture and stir to combine. Turn the heat up to high, and bring the mixture to a boil. Once the mixture is boiling, put the lid on the sauce pan and reduce heat to low. Cook for about 20 minutes*, or until liquid is absorbed and rice is fully cooked. While rice is cooking, mash avocado in a small bowl, using a fork, until totally smooth. Add salt and stir to combine. Once rice is done cooking, remove from heat and allow it to rest for about 5 minutes. Using a fork, fluff the rice. Add the avocado mixture and stir until combined. *The amount of chicken broth you use and the cook time for your rice depend on the instructions for the brand of rice you are using. If the instructions say to use 1 cup of water per cup of rice and cook for 20 minutes, then for this recipe use 1 cup of chicken broth and cook for 20 minutes. Ok this sounds so good. And I’m mad at myself for not thinking of before. Lol. Thanks, Nancy! It really is a good combination of flavors. I like the idea of trying it with different grains. So I made this rice yesterday, essentially as written (I didn’t have cilantro or parsley on hand but will def use that next time) and IT WAS AMAZING. So savory!!! My husband loved it as well! We used the leftover rice today and whipped up a breakfast fried rice with sautéed onions, peppers and squash. The kids demoslished that as well. So glad your family enjoyed it! I like the breakfast rice idea.